Lighten Your Load: The Core Energy Scan | Choose Your Energy: Change Your Life! Getting the blues occasionally is common. I know first-hand how debilitating long-term discouragement can become if left unchecked, having suffered multiple episodes of depression in my lifetime. Approaching life with love, respect, curiosity and compassion always reveals and advances the highest good, for all, in all, through all. Gratitude for Universal abundance anchors each moment in generous, effortless, gracious flow filled with faith, hope, prosperity, peace and joy. Love, respect, curiosity, compassion, and gratitude are not just five woo-woo, New Age words I pulled out of thin air because they sounded Zen and cool. They were revealed to me individually, real-time as I lived through the phases of my own dramatic and highly personal transformation. The formula for making them a way of life is simple to explain. In every situation, love yourself enough to pay attention to every aspect of your life. Respect everything you are experiencing—what you are thinking, feeling, deciding, saying, and doing. Determine whether the energy underneath is love or fear. If it’s love, you are probably on your authentic path. If it’s fear, demonstrate compassion for yourself. Foster gratitude by reminding yourself that everything is an opportunity. Then further neutralize the fear by bringing curiosity to bear. Explore every aspect of the situation, especially your internal landscape, and identify all of the opportunities available to you through this unique experience. As with any new skill, practice will help this way of being become a healthy new habit—your automatic response to every situation. With this rudimentary understanding of the roles of love, respect, curiosity, compassion, and gratitude in fostering constructive core energy and manifesting a life of flow, you are better equipped to notice when any one of the big five would benefit from recalibration and what form that might take. When, despite your best efforts, you become discouraged because you’ve temporarily strayed from the path of loving yourself unconditionally, a real-time Core Energy Scan can help you identify which aspects of your thinking would benefit from recalibration and what form that might take. Below you will find a snapshot of the worksheet used for the scan. In my book, Choose Your Energy: Change Your Life!, I provide a variety of scans to help you recognize when you are out of alignment and get yourself back on track, including the Core Energy Scan. Click here to download a FREE full-size, color version of my Core Energy Scan, along with full-size, color versions of all of the other illustrations and scans included in my book. Pay attention so that you notice quickly whenever fear creeps into your energetic mix. Invest your energy in assessing the root cause of the fear. Determine what baby steps will strengthen the presence of love in your reality. Hold yourself accountable for following through on your commitment to take action. Assess your results and continuously refine and expand your action plan to maximize the presence of love and minimize the presence of fear in the core energy with which you fuel your life. Having gotten honest with myself, if the results of the scan indicate there is something significant to explore but I don’t yet feel able to go deeper, I demonstrate respect and compassion by not forcing myself. I relax into exactly where I am on my journey. Caring enough about myself to notice and explore my unhappiness plants the seed for emerging insights. Whenever I invest my energy in conducting the scan, I’ve already taken an additional step toward recognizing unresolved fear inside me and moving myself forward on my personal journey to wholeness. You are worth the effort. With practice, you will turn unconditional self-love into a healthy new habit that will become a way of life. When love takes over your core energy, you will begin building the less stressful, more fulfilling life you dream of. The only person controlling your life is you. Turn unexplored possibilities into fulfilling realities by harnessing the transformative power of love to step into your greatness. Choose your energy and change your life! Here’s a bonus tool for turning your mood around when you feel down. It’s a proven best practice for boosting your sense of hope and fostering a spirit of optimism and gratitude. It’s much more effective than consuming a pint of ice cream in one sitting. What’s this powerful technique? 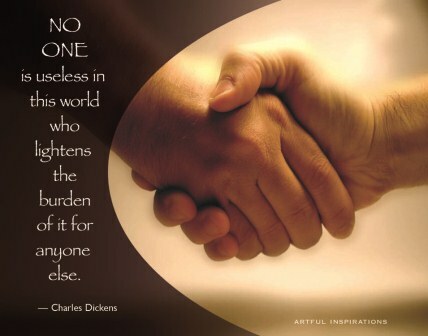 Lend a helping hand to someone else in need. Nothing cures the blues like taking your eyes off yourself and reaching out to help another. I have a client who used volunteering to help heal herself from the severe depression that followed her husband’s many years of suffering and death from cancer. While she was working with me to learn how to demonstrate unconditional love, respect, curiosity, compassion and gratitude for herself and her painful journey in each moment, she also reached out with passion and commitment to help others in need in her local community. When you serve others—and help lighten their loads—you make a difference. Knowing you’ve had a constructive impact in someone else’s life provides you a renewed sense of meaning and accomplishment. Next time things aren’t going your way and you are starting to feel down, in addition to conducting a Core Energy Scan to strengthen your demonstration of unconditional love for yourself, try doing something kind for someone else as well. It may be as simple as paying a compliment to a stranger or holding the door for a parent with a small child. Not only will you make that person’s day, you just may make your day too. Who do you know that could use a helping hand today? Whose burden can you help lighten right now? This entry was posted in All My Blog Posts, Curiosity, Respect & Compassion, Falling in Love With Yourself, Joy & Vitality and tagged Deborah Jane Wells, How to love myself, How to love yourself, What is compassion, What is curiosity, What is joy, What is respect, What is self-love, What is vitality. Bookmark the permalink.